NEW YORK, NY-It's been nearly three years since Dr. Robert Dottin, Ph.D., submitted a proposal to the National Institutes of Health requesting the installation of videoconferencing equipment at his workplace. Dottin is a biology professor at New York City's Hunter College and also the director of the Center for the Study of Gene Structure & Function. 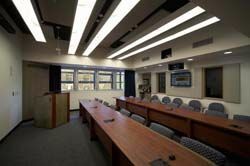 The Center for the Study of Gene Structure & Function at Hunter College was upgraded with a new videoconferencing system to enable realtime collaboration. A few months ago, his request was completed when the school's Distance Research & Learning Facility was reborn with a new videoconferencing system that promotes real-time collaboration experimentation and teaching projects within the global gene research community. Now, scientists can exchange and study detailed information with high visual and audio quality and real-time connectivity. The new facility was designed by the Walters-Storyk Design Group, which worked closely with Dottin as well as the center's facility manager, Carlos Lijeron, and project manager, Ed Pearlmutter. The school had a number of specific requirements, including the draining of peripheral noise that can often disrupt a videoconferencing session. Because of the school's urban location, street noise needed to be highly regarded. "A major factor with videoconferencing is background noise. Because we're close to the street, we don't want to hear sirens and traffic," said Dottin. "So the room had to be designed in such a way to block that out." WSDG assembled a sound curtain in the center's two rooms to combat these outside audio interruptions. The center totals 1,100 square feet of space on the third floor of the school's 69th Street campus. It includes advanced AV gear such as TANDBERG 990 MXP videoconferencing units and Internet2 connection, as well as Sony HD plasma displays. A Crestron Isys touchpanel controls the facility's overall AV functionality and can shut blinds, dim lights, and turn microphones on and off. Additional equipment includes Extron switchers, Shure microphones, and Mitsubishi projectors. One of the rooms is used primarily for observation, while the other serves as the main research room. The research room houses eight "smart desks" that were also designed by WSDG. Each desk seats two students and includes computer, phone, and AV connectivity. The desks can be configured into various shapes, including the horseshoe-shaped table popular with many of today's conference rooms. Dottin said the center's Internet2 connection is an integral part of the upgrade. Because of its high bandwidth capabilities, it enables students to gather information and analyze data much more expeditiously than before. Internet2 is not available to the general public; it's a consortium of universities that work with the government to enable and deploy advanced network applications and technologies for research. "You need a special fiber optic connection in your building," Dottin noted. "Hunter College paid a fee required to join the consortium." Dottin has been teaching at Hunter College for close to 20 years. The Gene Center conducts research in the areas of biology, chemistry, physics, and more. "We study how genes work, but because Hunter is a teaching institution as well, we offer a nice balance between scientific research and teaching," Dottin explained. Before the center was renovated, its two rooms had limited technology for special applications. To fund the project, Hunter College was awarded a grant by the National Institutes of Health. But the school also had to raise money from the taxpayers. The work paid off, as the upgrade has radically improved teaching and research methods at Hunter, particularly in the way information is transmitted and shared. "The system is really flexible. We can collaborate with students and teachers from different parts of the world-and even from home, students can access presentations via the internet," Dottin said. In addition to the Gene Center's two main rooms, WSDG also designed a mobile videoconferencing unit, which provides full AV and internet connectivity to individual labs within the facility. The studio can monitor real-time experiments ranging from behavioral studies of live lab mice to collaborative microscopy, and transmit live coverage to research institutions and universities participating in the Internet2 network. "It's a cart with all the elements of the studio, but miniaturized. We can even connect microscopes to it and collaborate with a colleague in real time in another country," Dottin said. "Students are learning more actively and becoming more involved in collaboration. That means they're more likely to understand and retain information and project new ideas."